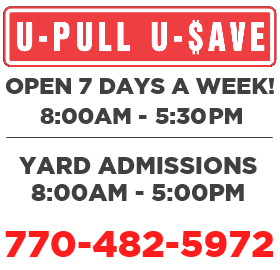 Auto Salvage Atlanta | Used Auto Parts In Atlanta - U Pull U Save | S&W Automotive Parts, Inc. Welcome to S&W Automotive U-Pull U-$ave! We are a self-service used auto parts facility conveniently located just off I-20 in Lithonia, GA. Our facility has thousands of vehicles onsite with friendly customer service and yard location maps to help you find the parts you need. Use our free wheelbarrows, or rent a golf cart to help transport your parts in style! Unlike other self-service yards, our emphasis is on late model vehicles. We update our inventory daily so if you don’t find what you need check back often. Open seven days a week, our staff is ready to serve you. Bring your own tools, (must be 16 or older to enter), and come see why everyone is talking about the best do-it-yourself facility in the Atlanta area. 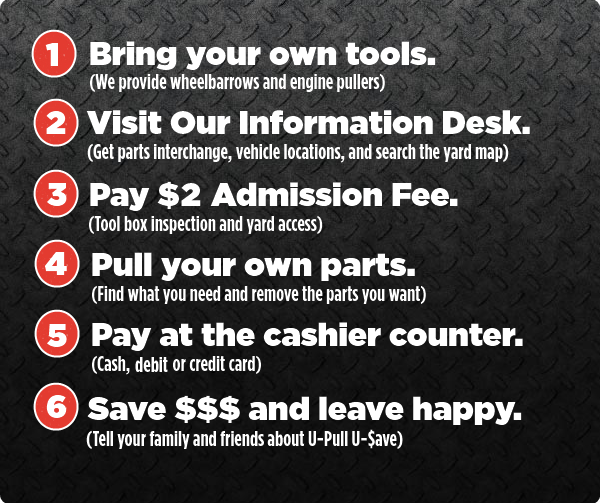 Be sure to tell your family and friends how much you saved by pulling your own parts at U-Pull U-$ave! While you are visiting our self service location, you can also check out our full service facility (S&W Automotive Parts), Used Cars Sales, and Tire Center. Our staff at each of these facilities are ready to help you!